Last week a shot of sinkholes on the shore of the Dead Sea with the cliffs above En Gedi in the background, this week a shot of a hole in the rock, a natural sculpture on the cliffs. You can click on the image for a larger view (which may take some time to load depending on your Internet connection). Please share this post with your friends by clicking on the icons at the end of this message. The technical details – the photo was taken with a Nikon D90 (digital SLR) camera with a Nikon 18-70mm lens on October 27 (ISO 200, 25mm, F10 at 1/400 sec). For more ideas on other hikes in the area check out my post at https://israeltours.wordpress.com/hiking-israel/. 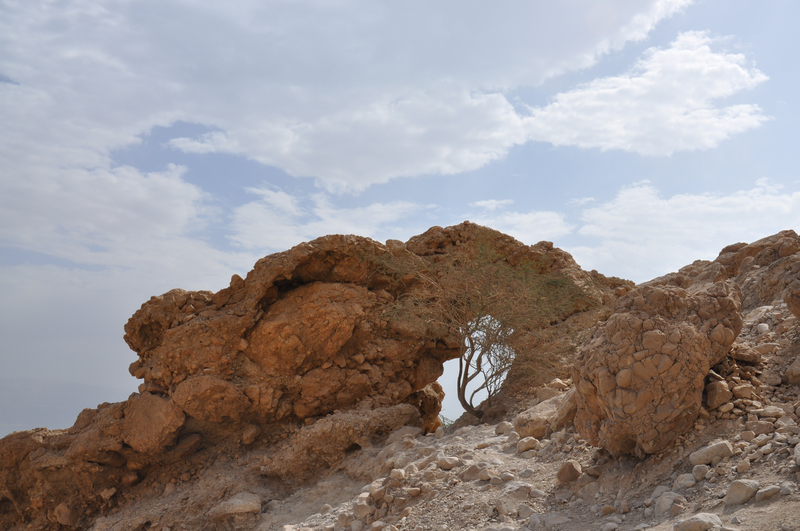 This entry was posted in Desert, Nature, Photography and tagged Israel photo, photo of week, Photography, rock sculpture on September 16, 2012 by Shmuel Browns. Is this taken on the way to the Chalcolithic Temple above Ein Gedi? It looks familiar to me. Yes, it’s the ridge in the direction of the Chalcolithic temple. I shot the photo from Nahal David.